Looks like John gave you the backstory on our interview with PHOTOMOTO owner Austin Havican from Wednesday. Pretty cool, right? This is Trisha, and I’m going to fill you in on the rest of the details of our day on Wednesday where we went from Lumberton to Houston to meet the owner of PHOTOMOTO, and more cool small businesses in Houston! 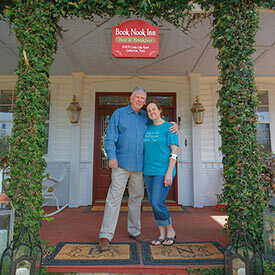 But first I have to tell you about the cool bed and breakfast we stayed at in Lumberton, TX, the BOOK NOOK INN. Upon arriving at BOOK NOOK the night before, we were greeted by David and Stacie Hearne who showed us around their amazing house. David and Stacie told us that the neighborhood kids love to stop by and just walk around the house to see the cinema room, the pool, the hot tub, and all the little nooks of the house. 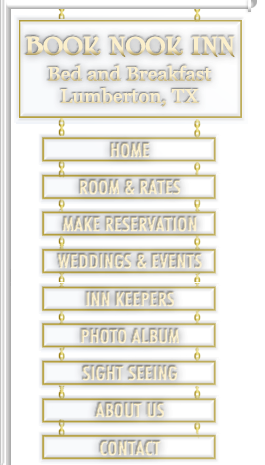 Their space is often used for wedding and graduation pictures. We would have loved more time to explore BOOK NOOK INN, but alas we had plenty of small businesses to meet yesterday in Houston. So Stacie made us a great breakfast with delicious coffee, pancakes, and bacon, then we said our goodbyes and hit the road! As you read in our previous blog post, we had an awesome time talking with Austin (of PHOTOMOTO) about his mobile photo booth. Make sure to check out the video to see Austin’s cool vintage VW bus! Afterwards we checked out a little shop that I just loved called MY FLAMING HEART. Located on Main Street in Houston, this cute shop had tons of cool jewelry AND handmade dresses that the owner, Judy Masliyah, makes herself. They also had cool vintage boots! It was awesome to hear that every month MY FLAMING HEART has a block party to support local charities. They also have a wall that they hang local artwork on that they switch out every month. I definitely loved the local Houston vibe and the sense of community among the small businesses via MY FLAMING HEART! Speaking of small biz and community, we just couldn’t get enough of PHOTOMOTO owner Austin, so he joined us at DOUBLE TROUBLE CAFFEINE AND COCKTAILS where we got hooked up with some delicious ice coffees. 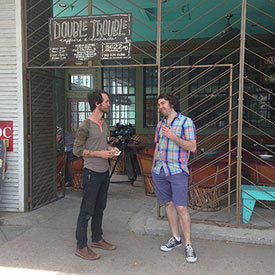 DOUBLE TROUBLE has a great outdoor patio that we enjoyed our coffees on, and discovered that almost all of their ingredients are made in-house —which I find VERY cool! Yesterday was our second day in Houston, and I can’t wait to share more about the uniquely creative small businesses the city had to offer us!